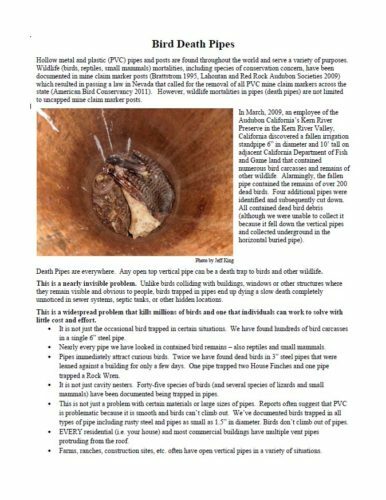 In March, 2009, an employee of the Audubon California’s Kern River Preserve in the Kern River Valley, California discovered a fallen irrigation standpipe 6” in diameter and 10’ tall on adjacent California Department of Fish and Game land that contained numerous bird carcasses and remains of other wildlife. Alarmingly, the fallen pipe contained the remains of over 200 dead birds. Four additional pipes were identified and subsequently cut down. All contained dead bird debris (although we were unable to collect it because it fell down the vertical pipes and collected underground in the horizontal buried pipe). Death Pipes are everywhere. Any open top vertical pipe can be a death trap to birds and other wildlife. Several resources below reveal methods of dealing with this easily preventable bird death.